Mint Hill NC real estate is loaded with great finds for individuals or families to enjoy. Perhaps you want to find a place that will keep boredom at bay, without having to pay the $30-and-up admission that many amusement parks require. The great news is you can stay active, happy, and healthy through the recreational centers near Mint Hill NC real estate. Mint Hill NC homes for sale are conveniently located near Charlotte and local civic organizations, ranging from the arts to athletics. You can finally have it all – a location near the large city but without with an excessive number of people. By choosing a smaller town nearby with lots of amenities and social activities, you’ll find out why Mint Hill NC homes for sale are so appealing to so many people. Mint Hill is approximately 11.5 miles to the city center with the average commute lasting about 30 minutes. The airport and multiple interstates are all within 20 miles as well, making Mint Hill an advantageous location for the frequent traveler. Keep in mind that other communities that might fit your needs, too. You can also explore real estate in Charlotte and homes for sale in Matthews, NC. You’ll find close to 15 civic organizations, which include (but are not limited to) the VFW, Eastern Star Mint Hill Chapter, Kiwanis Club and Masonic Lodge. There are also associations for the arts and athletics, with clubs like the Rotary Club and Optimist Club, the historical and Scottish societies and women’s organizations like the Mint Hill’s Heartbeat Women’s Business Connection. You’ll find movies and concerts on the lawn at Mint Hill’s town hall in the summer months, which are free to the community. After you enjoy your summer entertainment, you can stroll through The Village, Mint Hill’s downtown revitalization project that includes quaint shops and restaurants, or you can stop by the Mint Hill Arts Center. Designed as a support network for local artists, the center doubles as a cultural center for the public, offering both free and low-fee classes and workshops in arts like watercolors, oils, jewelry and more. Don’t miss out on the Friday night gallery crawl that exhibit works by local/national and internationally known artists. These events have become a big hit with the locals and are starting to receive recognition within the arts community. Much of Mint Hill NC real estate is also near Fairview Park, which opened in 1997. With over 55 acres to explore, you’ll find just about everything like racquetball, tennis and beach volleyball courts. There’s a golf course and a natural trail planted with native foliage. The park’s main highlights, however, belong to the two Bermuda soccer fields and the asphalt bike/rollerblade path that outlines them. There’s also Wilgrove Park – the first municipal park in Mint Hill, built in 1974. It’s equipped with a lighted softball field, four tennis courts and several large and small picnic areas. There is also a walking trail that outlines the park, which also holds an array of playground equipment for the kids. If a modern community is what you’re looking for, but you still want privacy, then consider Mint Hill. You’ll find a hometown community that offers big city specialties. 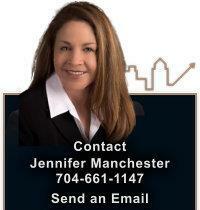 Start by contacting me, Jennifer Manchester. I’ll help you find the perfect place among the many Mint Hill NC homes for sale.